That whole getting you from point A to point B thing. It does that phenomenally. It doesn’t really look like the James Bond version of a clown car. And that’s important to you. Wave a paddle around furiously for The Bruce Weiner Collection Auction, a two-day public auction where hundreds of the world’s smallest cars will be put on the block for your oddly satisfying pleasure, happening next weekend an hour east in Madison. In case you’re wondering who would accumulate so many microcars, a former Dubble Bubble executive would. That’s who. A Dubble Bubble guy. Anyway, he filled a museum with 20 years’ worth of tiny collectible cars. And now, well, he’s over it. Closing up shop forever. Done. Register now and make the 60-minute drive to Madison next Friday. There’s a metallic blue ’57 Vespa. A BMW police car that measures 9 feet 4 inches. 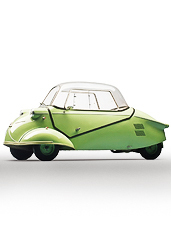 A three-wheeled 1954 Mivalino that’s the only Italian iteration of the Messerschmitt in existence (we assume that’s important to someone). You can see it now: you’ll go. You’ll bid big. You’ll drive away the proud new owner of... a car that’s really good for parking in tiny spaces. And basically looks like a street-legal go-kart. And is presumably perfect for racing baby Clydesdales. If that’s a thing that you’re interested in doing.